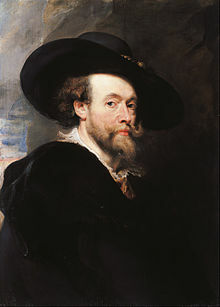 Sir Peter Paul Rubens (/ˈruːbənz/; Dutch: [ˈrybəns]; 28 Juin 1577 – 30 Mey 1640), wis a Flemish airtist. He is conseedert the maist influential airtist o Flemish Baroque tradeetion. Rubens' heichly chairged composeetions reference erudite aspects o clessical an Christian history. His unique an immensely popular Baroque style emphasized muivement, colour, an sensuality, that follaed the immediate, dramatic airtistic style promotit in the Coonter-Reformation. Rubens specialised in makkin altarpieces, portraits, laundscapes, an history pentins o meethological an allegorical subjects. In addeetion tae runnin a lairge studio in Antwerp that produced pentins popular wi nobility an airt collectors ootthrou Europe, Rubens wis a clessically eddicatit humanist scholart an diplomat that wis knichtit bi baith Philip IV o Spain an Charles I o Ingland. Rubens wis a proleefic airtist. The catalogue o his warks bi Michael Jaffé leets 1,403 pieces, excludin numerous copies made in his wirkshop. His commissioned warks war maistly "history pentins", that includit releegious an meethological subjects, an hunt scenes. He pentit portraits, especially o friends, an sel-portraits, an in later life pentit several laundscapes. Rubens designed tapestries an prents, as weel as his awn hoose. He an aa owersaw the ephemeral decorations o the ryal entry intae Antwerp bi the Cardinal-Infante Ferdinand in 1635. His drawins are predominantly verra forcefu but nae owerly detailed. He an aa made great uise o ile sketches as preparatory studies. He wis ane o the last major airtists tae mak consistent uise o widden panels as a support medium, even for verra lairge warks, but he uised canvas as weel, especially whan the wark needit tae be sent a lang distance. For altarpieces he whiles painted on sclate tae reduce reflection problems. ↑ "Rubens". Random House Webster's Unabridged Dictionary. This page wis last eeditit on 18 Mairch 2018, at 07:45.